Well, Zed's not a Champions character so its not quite the same thing. And for all their killbot similarities, Mechanon is pretty far afield of Ultron. There's a Oedipal, very angry aspect to Ultron that Mechanon and a lot of other evil robot types lack. Responsibility As a champion of Yugash, Blossom has several duties and obligations. Power Loss Blossom's abilities rely on manipulating Essence, if he uses his powers too frequently he will lose access to his magical powers until he has time to rest. Stubborn Blossom is not a man of compromise, and his overly rigid nature can cause problems for himself. Motivation: Blossom believes it his duty to promote right thoughts and actions, and to point out wrong ones whenever he sees them. •An Alchemical Exalted, Excessively Righteous Blossom's name tells you basically everything you know about him. He's a hero of his nation who wants to do the right thing-and absolutely nothing else. This makes him the kind of undercover operative who pursues all crime, even the smallest ones, the kind of military mind who pursues victory regardless of consequence, and now he is an honorary lector, a member of the Theomachracy who is basically an itinerant preacher working to keep morale high. As with everything he does, results are...mixed, but there's no doubt Blossom cares for his people and Autocthon himself and would do whatever he could to sustain and aid the Great Maker. 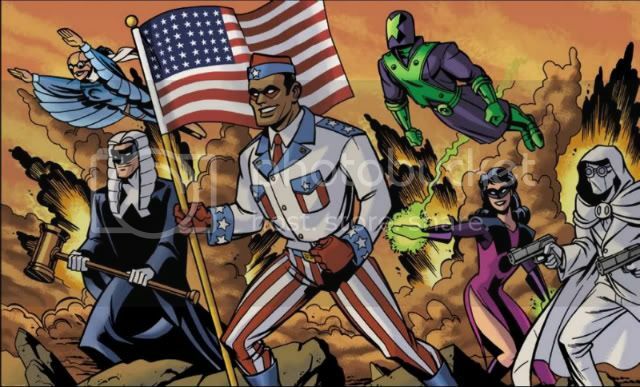 •Obviously, more traditional superheroes would only encounter Blossom and other Alchemicals if they entered Autocthonia, or the great Primordial entered Earth's dimension somehow. In either event, Blossom serves as an excellent Champion-an infiltrator, a saboteur, and a deadly duelist, but he has no head for strategy or actual command. His skills are good, but not great, and need help from his Charms-his stealth and deception are far more useful when he changes his form or turns invisible. 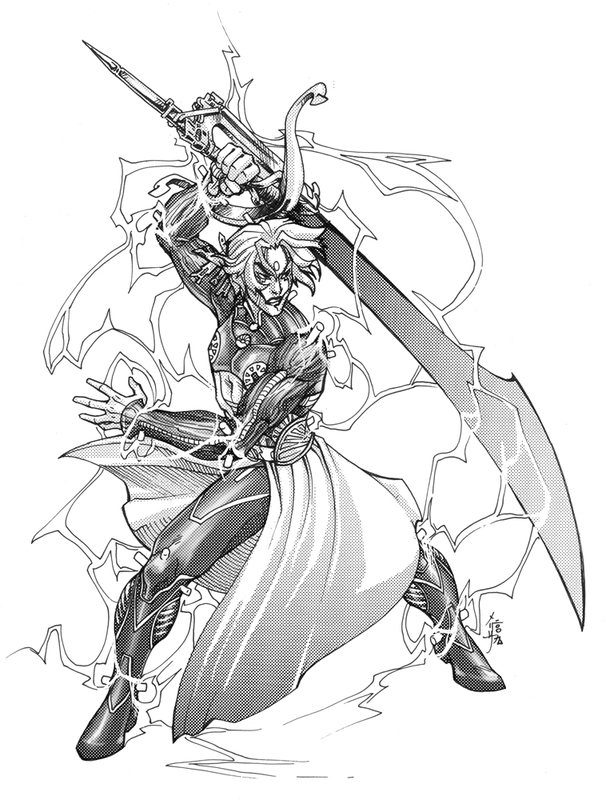 He can charge his body with electricity, use Essence to manipulate his crossbow bolts in a flurry of attacks, and is a little bit faster than normal like all of his Caste are. I also turned a lot of lesser Charms into Advantages, so while he's by far best at combat, he is at least slightly versatile. Last edited by Arthur Eld; 07-19-2018 at 07:16 AM. Enemy Prince Primordial, among others. Relationship: Reinahrdt is close with his partner, Soul Sista, and cares as deeply as he can for his son, the Avenger Velocity. He also has a creation he looks after, Chimpandroid. Responsibility As a member of the LDPD, Reinhardt has duties to uphold and a code of conduct to behave by. Motivation: Doing Good While he tends to only care about them in the abstract, Reinhardt works his hardest to protect anyone in need. Prejudice As a Metahuman, Reinhardt sometimes faces prejudice. Doubly so as a police officer, and also as a champion of the rights of artificial persons. •I also added a few things Reinhardt didn't have to show how the character has changed in the years since the campaign ended. For one thing, he never had wealth, but should have had. He gets a few interpersonal skills to show he's not quite helpless in that regard, though by no means good at it (he has some UC experience). He also gets Second Chance (Fortitude) because it is his weakspot and because he had a tendency to jam himself full of super science drugs when he needed to enhance his powers (like he hacked into a alien spaceship in orbit from the ground). Frequent uses of his Variable were X-ray specs, rocket boots, force fields, and all kinds of ray guns, from typical blasts, to freeze rays, electric guns, shrinking rays (Ranged Shrinking Attack), and more besides. Last edited by Arthur Eld; 08-10-2018 at 03:41 PM. Motivation: Justice Jenkins is driven to make sure the rule and spirit of law apply to everyone who would break it. Relationship With her son, Solomon and her partner Reinhardt. Fish out of Temporal water Jenkins 'died' in 1976, and the world now is a very different place, so different it often causes difficulty for her. Enemy Jenkins frequently finds herself dealing with the villains Query and Echo. •Soul Sista was a cop in Los Dios back in the 70s- Deborah Jenkins. She sacrificed her life to protect citizens from a supervillain, and was believed to be dead. Eventually, she reformed as a ghost-like entity, out of phase with the rest of the world. She haunted Los Dios for years until reports of the ghostly woman brought a current Los Dios police man named Reinhardt. The inventor built a device that altered her phase, bringing her more in touch with the world, although she still lacked a corporeal body. Jenkins got her old job back as a police officer and became Reinhardt's partner, and the two have worked together for years. Following an adventure in which their states of phase were swapped, Jenkins was eventually given more control of her form, now able to be fully corporeal when she desires, though her default is still ghostly. She also gave her DNA willingly to Reinhardt, which he used to create life, a boy named Solomon that they both raised. •Some major modifications to this build, which was an old 365 Supers one I did. I brought her up to Reinhardt's level (I figure he's just one of those fictional cops who attracts insane amounts of danger and excitement) mostly by bumping up her ranks. 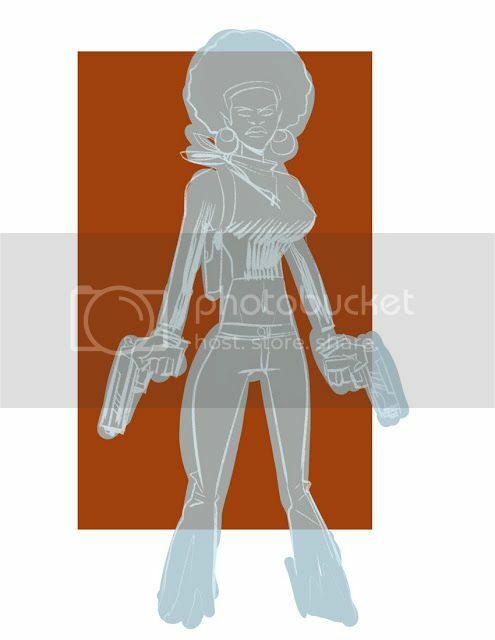 In human form, she loses most of her defense, though she still has offensive power, able to do the old Vision trick of shoving her half corporeal hand in somebody's chest, or just summon her big ghostly guns and blow chunks in anything as insubstantial as a specter or solid as concrete. Her skills get a slight upgrade-Reinhardt's a better investigator but she's better at the interpersonal side of police work. From Freedom City, this six-person Golden Age team joined together shortly before open hostilities with Japan. After Pearl Harbor, they sent out in the Seahawk's Flying Submersible, only to be intercepted by Dr. Tomorrow. The time traveler had foreseen that they would be ultimately be defeated, captured, and brainwashed in Japan, with disastrous consequences for other American heroes. So instead, he transported them to modern-day Erde, the world where the Nazis and their allies had conquered the entire world. Now they serve as shining beacons of America's past greatness, and the hope that tyranny can be defeated and freedom restored once more. As these builds are conversions of some really early 2E builds, I've tweaked them a bit to make each team member more niche (originally they had like 3 characters with the equivalent of Intellect 7) as well as to reflect my personal build style and give them all slightly more than starting points to reflect some of the cost changes from 2E to 3E without losing the essence of the character. •Magister was a little tricky, but I saved points by dropping his roadster (how would he even have it on Erde, plus the Sea-Hawk makes it redundant), and making some of his other gadgets Equipment. I could have done the same with his Prison Bars, but it just didn't 'feel' right. •Sea-Hawk is a well-balanced character, and more importantly, she's the team's ride, able to fly or go underwater. I dropped her INT a little to save points, but it didn't affect her skills too much. And honestly, one team doesn't need three geniuses. •The Commander was probably the toughest character to get down to points, tied with maybe the Agent, because of the difference in price between Transform in 2E and 3E. The big difference is that his Transformation isn't Continuous in this build. But honestly, Continuous Transform is a really powerful effect, so even without it he's a potent fighter, decent mook-sweeper, and good team player. •Dr. X wasn't too hard of a build to chop down to points. He's got a few decent options in combat, and when needed, can whip up a pretty potent Invention to tackle whatever threat du jour the Freedom Brigade comes across. •A former secretary turned radioactive blaster, MMR is built to zip around the battlefield, throwing around energy blasts from the relative safety of the sky. It helps that the Nazi supers the Brigade fights are mostly mutants, against whom Radium's Nullify is a potent threat. •The Invisible Agent is the build I'm least happiest with, and the one I knew going in would be trouble cause his initial 2E build was a mess-way undercaps. Still, I think I hit the high notes-he's a genius spy, but not too overwhelming at actual spy stuff, relying on his invisibility as an Ace in the whole. But against even well-trained mundane forces, its going to be a very powerful gimmick, as even things like infravision can't detect him. Then he just has to move quietly to get out of dodge. Definitely not a front-line fighter, he's built to go on solo stealth ops and come back with vital information, rather than causing sabotage or engaging in destruction. He gets inventor for run one-off weapons, explosives, spying equipment, and other tools he can have to even the odds and bring himself more up to caps. I tweaked his equipment a bit to give him more offensive power and to limit his actual equipment on hand-he's on acquire on site kind of guy, I feel. Enemy Levi is watched by his creator, the demon Croatoan, who wants him under his control, or killed. Project Inferno Levi was created to be a superhuman warrior to help conquer the earth for demons. Those who are aware of this are likely to be suspicious of him. Rival With another creation of Project Inferno, Ellis, the Devil's Own. Part of a Set There are others like Levi out there somewhere, who may have their own plans for him. Prejudice Levi is clearly non-human, and cannot maintain a proper secret identity. Motivation: Doing Good Levi considers it his duty to use his power to help people however he can, to counteract the dark purpose he was made for. Aquatic While Levi is comfortable on land, prolonged periods without exposure to water will leave him dehydrated and weak. There is a place called The Ninth Circle, located not in the deepest depths of hell, but rather in an isolated part of the Canadian wilderness. There a demon named Croatoan created a facility to create cloned, loyal superhumans to serve as a vanguard for his own army of techno-demons. For decades, going back as far as the 1930s, this Project has functioned as a secret arm of Canada's government, ostensibly to create super-soldiers, but always headed by corrupt beuarecrats and mad scientists. Every time it gets shut down, it never stays buried for long. Most recently, in 2017, Croatoan urged the Project's latest directors to keep in mind that earth's surface was largely made of water, and its newest creations should be able to function in the deepest, coldest oceans. Of course being aware that most of the planet's population didn't actually live in the water, the scientists decided to get themselves a man who could do both. Combining human genetics with those of the killer whale, along with old-fashioned forbidden magics, the scientists soon had a fairly sizable force of stable, healthy orca-human hybrids, designed to be elite hunter-killers. However, as mad scientists are wont to do, the spent countless hours needlessly tinkering with the design even after they had a proven mass-production model: this one faster, this one stronger, this one augmented with magic or on-board cybernetics. So well before they were ready to unleash them on an unsuspecting populace, Team Canada showed up to shut the facility down, tipped off by former 'guest' of the Project, Ellis, the Devil's Own. The few hybrids already loyal to Croatoan were killed, the lab was destroyed, and most of the rest were kept in the state of suspended animation they were in. So Levi moved to Freedom City, where he's been operating as a part time deep sea salvager, rescue diver, and superhero ever since. Aware that he'll never quite fit in among most humans, Levi refuses to let that stop, finding great joy and satisfaction in using gifts that were meant for evil to help and protect people. 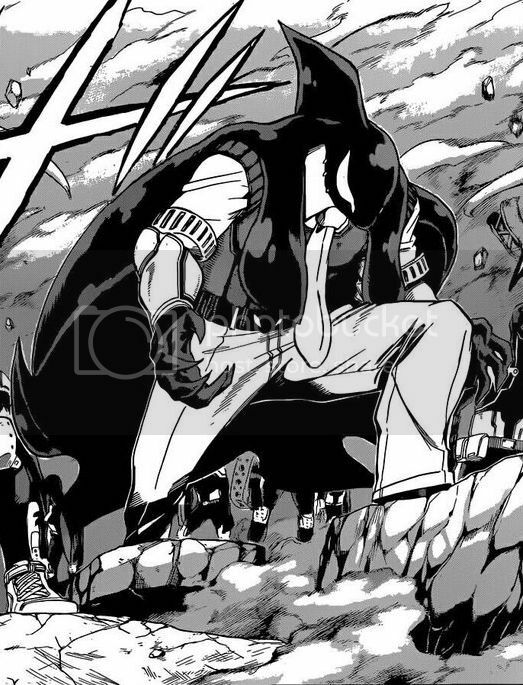 Powers/Abilities: Levi, as a strange hybrid of killer whale and human that is an improvement on both, is superhumanly strong, able to lift 25 tons, resist small arms fire, and withstand the hostile environment of the ocean. In addition, he is faster than his size would suggest on the land, and much quicker in the water, being capable of sudden speed as well as tight maneuvers. Designed to hunt down targets on land or in the water, all of Levi's senses are almost preternaturally sharp. In addition to the echolocation common to whales, Levi's organs were modified to be able to create dangerously high frequency noises and project them outward as a sort of sonic stun weapon (perhaps an ability unique to his 'batch' of hybrids) a weapon he uses against softer targets. Appearance Levi stands out in crowd, standing just under seven feet in height, and built along sleek, yet large lines. 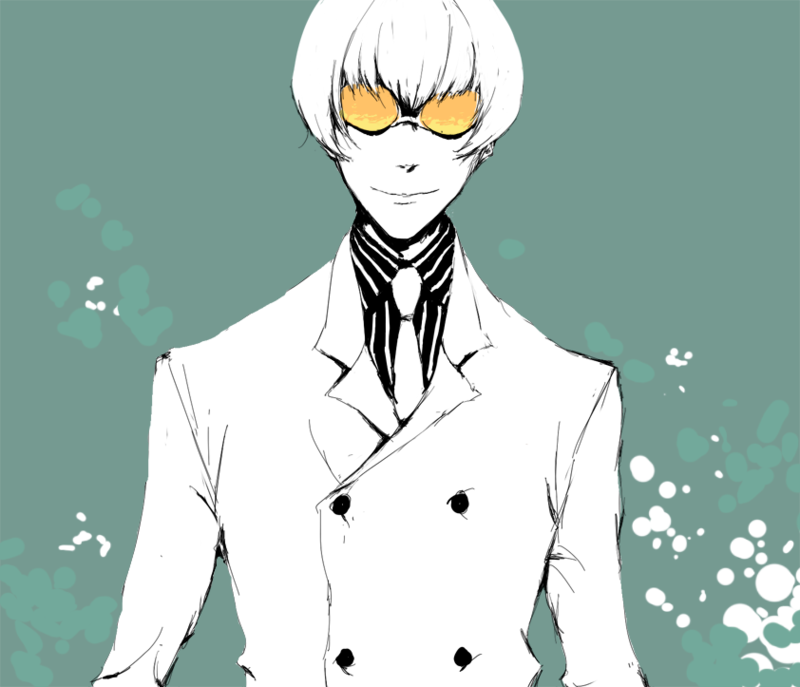 His 'eye patches' are stark white, while his skin has an almost glistening sheen to it. Unencumbered by the need for clothing but aware of the necessity of decency, Levi frequently dresses in formal wear to appear more 'human', though his costume resembles a diver's suit (which he also has no need for). Somewhat surprisingly, given his size, his voice, while fully fluent in human speech, is rather high-pitched. •Created for a Freedom City based game in the Game Room and taking inspiration from some background in the Atlas of Freedom, Orca is basically what Gang Orca from MHA would look like if I ever built him, squeezed into points per and maybe one PL lower than what he would be.